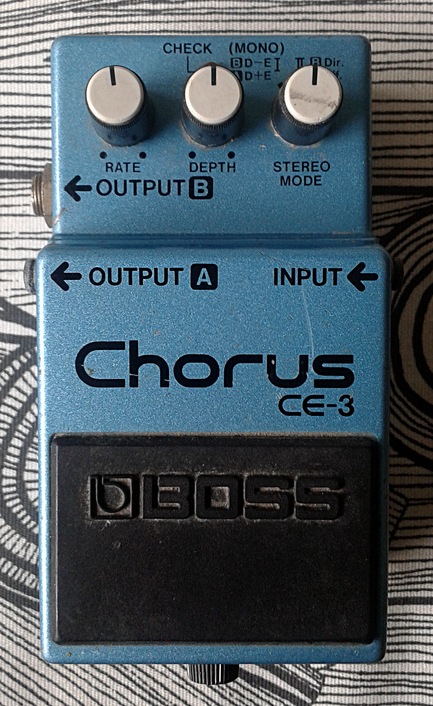 Boss CE-3 Chorus, made in taiwan, august 1988. 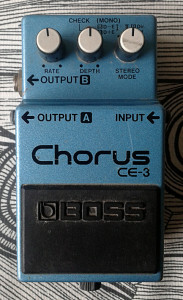 Boss choruses are all praised, even though the CE-3 has less reputation if compared the obvious classics like CE-1 and CE-2. With less reputation comes a less numbers on the price tag on auction listings. This particular unit is one of the very first CE-3s to come out of taiwan plant. CE-3 is the first Boss chorus with stereo output and there are couple of interesting things on the pedal. Like the position of the three knobs. Bossarea has more information listed. 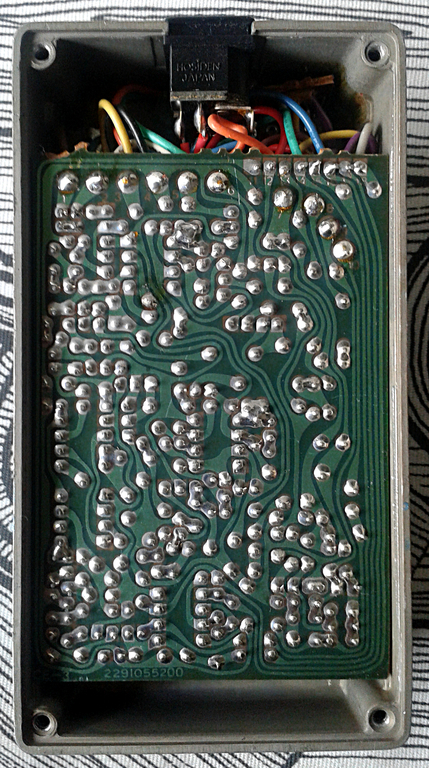 Board design is pretty with old school traces, but disturbing asymmetry on the layout. 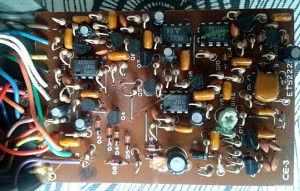 There is a schematic up on Synthdiy. 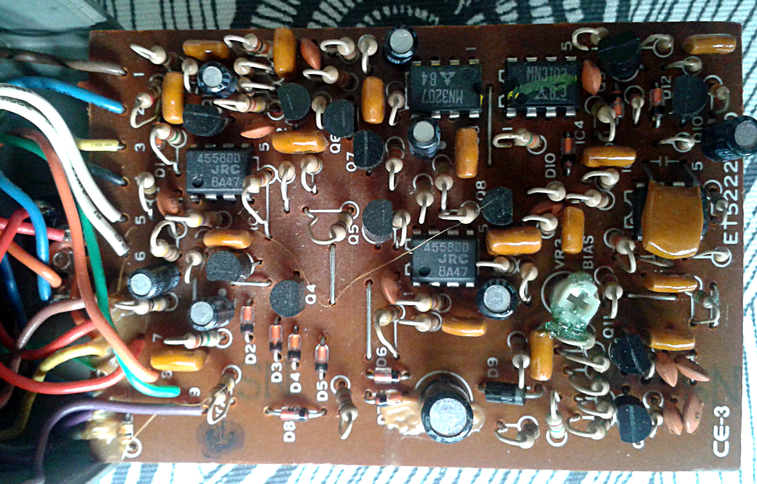 Design is pretty common with two 4558s to drive the signal after the FET buffer and after the BBD modulation stage. 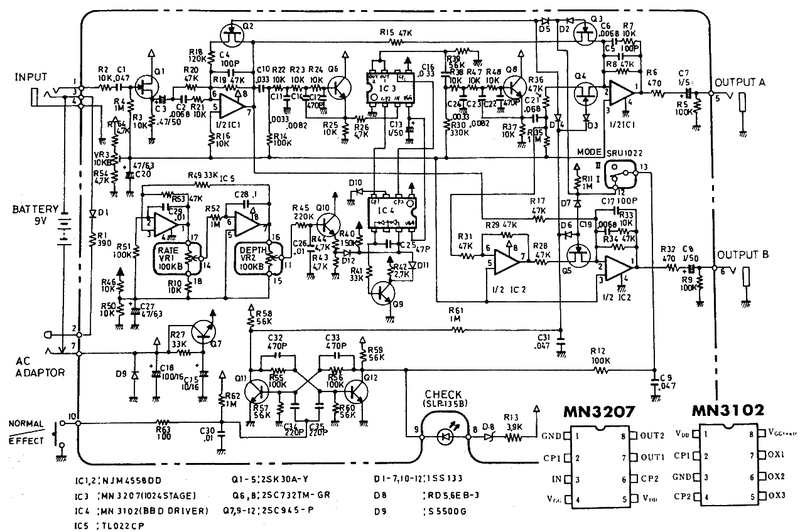 The modulation stage is based on MN3207, a 1024 stage analog bucket brigade device. 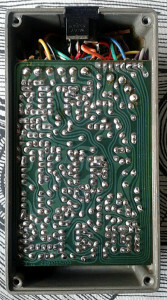 That chip is controlled by a MN3102 clock. Rate and depth are controlled by LFO, constructed with one TL022. Stereo operation can be used to push zero and reverse phases to their own outputs, like many modern stereo choruses. In general, everything about this unit is great. Vintage feel to the design, construction and it even offers some eye candy being as ugly as it is. And the most important part is yet to come..
Soft and natural chorus. May not be as mellow and 70’s sounding than CE-1 and CE-2, but there isn’t that cold harsh detune around that, at least in my opinion, kills the usability of countless chorus designs. Depth control is sufficient, but i was surprised how slow the Rate is, even when maxed. This is a feature that makes the unit have a soul of its own. Definitely one of the best sounding vibe-like chorus pedals in the price range. This entry was posted on Sunday, August 3rd, 2014 at 15:55	and is filed under Boss, Compact Series. You can follow any responses to this entry through the RSS 2.0 feed. You can skip to the end and leave a response. Pinging is currently not allowed. Entries (RSS) and Comments (RSS). 23 queries in 1.069 seconds.